THE Rockhampton Rockets claimed the 2013 QBL Men's Championship title on Saturday night in front of a packed Hegvold Stadium. 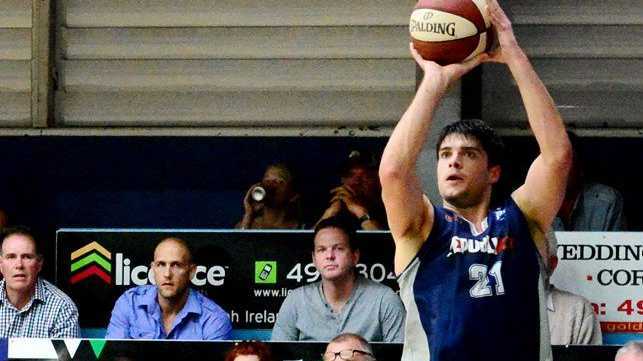 Rockhampton were tested by Northside in Friday's semi-final but secured a grand final berth on their home floor with a 91-80 win, while Brisbane defeated Townsville in the semis to claim the other spot. On Saturday, the Rockets sealed a 102-95 victory over Brisbane in a match that saw the Rockets come out swinging to score 36 points in the first quarter, and quickly build a double-figure lead to be ahead by 15 points at the first break. The Rockets maintained their upper hand with a comfortable lead in the second and third quarters, with the Capitals trying desperately to put a dint in the margin but unable to reduce Rockhampton's lead to single figures. With ten minutes left in the game the visitors came back from the final break and managed to find more success at the basket, finally reducing the Rockets' lead to single figures in the dying minutes of the match, but it wasn't enough to take the title away from the home-side, seeing the Rockets take their third QBL Championship title from six consecutive grand final appearances. Rockets guard Mitch Philp took out the game MVP award for his effort of 26 points including six three-pointers and eight from 10 free throws, in addition to seven assists and two steals in just over 29 minutes on court. The women's championship match between Hosts Mackay Meteorettes was a close affair for much of the game. However, Mackay regained control in the last two quarters to win 76-59, and claim their second consecutive title.